February is American Heart month. I’m putting a healthy twist on an American classic- burgers. My Pistachio Lentil Burgers are packed with flavor so you won’t even miss the real thing. Pistachios are one of my favorite snacks because they are so high in protein and fiber. This heart healthy nut fills you up and keeps you full until your next meal. Scientific evidence suggests, but does not prove that eating 1.5 ounces per day of most nuts, such as pistachios, as part of a diet low in saturated fat and cholesterol may even reduce the risk of heart disease. Since pistachios are such a tasty snack– why not add them to a burger? Say hello to a delicious, heart healthy, flavor packed vegetarian burger. 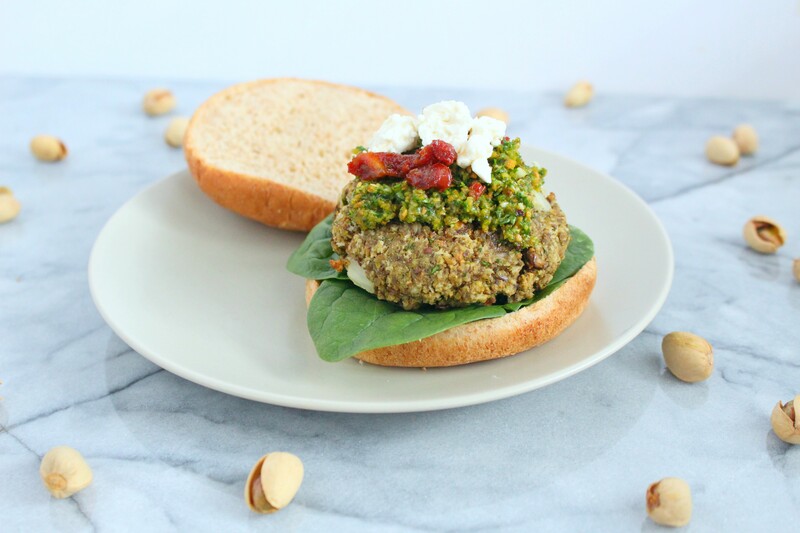 My pistachio lentil burgers are topped with sun- dried tomatoes, feta cheese, and special sauce that will give your favorite burger joint a run for it’s money. Bring the lentils and water to a boil. Reduce heat to low, cover, and simmer for 25-30 minutes, until tender but not mushy. Drain excess water. In a food processor, pulse together the parsley, pistachios, and garlic until finely chopped. Add 1½ cups of the lentils, and pulse again until mostly smooth - it will be like a paste. Mix together the pulsed ingredients and remaining lentils. Stir in the salt and Worcestershire sauce. Taste and adjust to your liking, then add the egg, and stir in the breadcrumbs ½ cup at a time. Roll ⅙ of the mixture into a smooth ball. Flatten into a burger patty shape. Place on a parchment-lined baking sheet. Repeat with remaining mixture. Bake for 20 minutes, 10 minutes on each side until golden and firm. Top with feta cheese and sun-dried tomatoes.